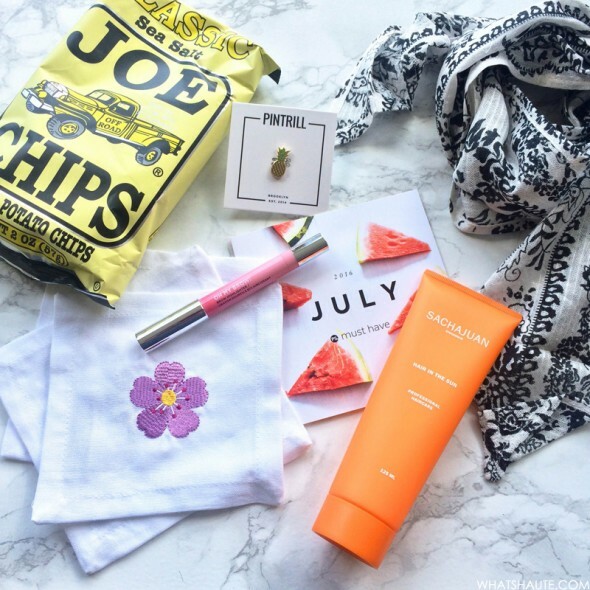 Check Out What’s Inside the July 2016 POPSUGAR Must Have Box! This highlighter is perfect for adding a bit of light shimmer to your brow bone. It has a highlighter and smudger, and it’s great to use right after a fresh brow wax. The box also came with a card for a free brow wax at European Wax Center, so it’s the perfect pairing. This lightweight hair styling cream has a UV-filter that stays in your hair long after washing, keeping it protected while looking great! This black and white floral print scarf is just the right size to wear as a headscarf or bandana, or as a skinny neck scarf. It’s versatile in size and color – black and white works with everything! Pineapple obsession is so real! Pineapples are in everything right now, including music, fashion, home goods and accessories. This cute enamel pin features yellow and green colors over gold plated brass, with a black rubber back. This was a “Special Extra” included in the July box. These cutesy napkins are great for summer parties, and oh-so-trendy, with popular emojis sewn onto each one. 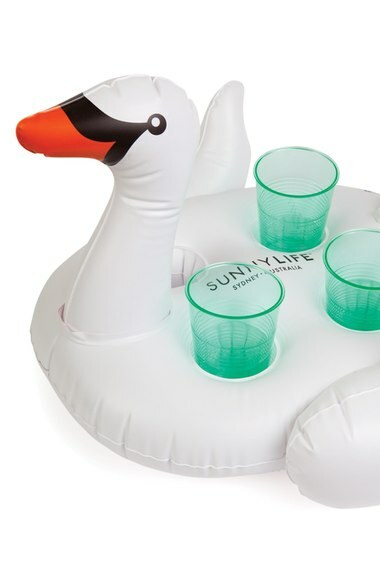 I haven’t been to the pool yet this summer, but this inflatable swan is the perfect excuse to go! This pool float is sectioned with four cup holders so you can have your summer cocktail and your pool, too! What would a must-have box be without a tasty treat? Grab your own POPSUGAR Must Have Box, here! It retails for $39.95 a month, but you can use coupon code SHOP5 to get $5 off your first Must Have Box! This post was sponsored by POPSUGAR. All thoughts and opinions are my own. I didn’t know that Popsugar had a box. Looks like you got some great beauty items to test out! Wow! I never heard of them before. You received a lot of items for $39.95. That’s what’s up. I get the Ujaama box monthly. I’m not big in yo subscription boxes after a few disappointing ones. However, that pop sugar box seems like it’s full of a ton of goodies for the price! Wow this a pretty comprehensive box. They have something for everything and everyone. This box contained some interesting items. I think the pineapple pin is my favorite item, then the snack of course :). That’s not bad for $35. Anytime you throw chips in a box, I’m down lol. But seriously, I love the combination of beauty, accessories and food. Now this is a box I would not mind getting every month. This box is fun and exciting!!! I have been trying to resist subscribing to this box. Your post isn’t making it easy. I think I will definitely try it out really soon. You definitely seem like you get a lot of value for your buck with this box! I love the variety of products that come in it.